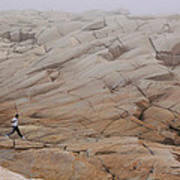 There are no comments for Rock Jogger At Peggy's Cove. Click here to post the first comment. 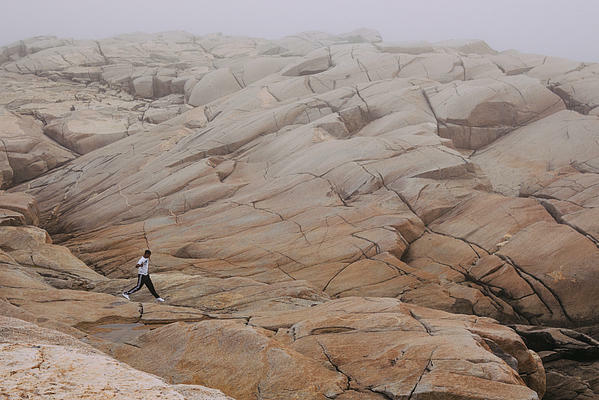 This photograph was taken in late summer of 2013 at Peggy's Cove, Nova Scotia. The young man in motion was skipping confidently along a rock valley that led into a dangerous sea break. The mark of heavy, big-sea waves can seen in the bottom right corner, where the Atlantic Ocean has stained the cove stone black. 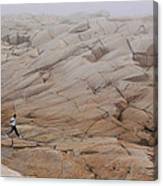 Toronto-based photographer and student of Urban and Regional Planning at Ryerson University. I dream of woods, forests, thickets, brush. Find me @theksavo on Instagram for day-to-day life snapshots.